Connelly plays Sarah, a distraught young teenager who wishes her baby stepbrother to be taken by Goblins. When this somehow actually occurs, Sarah is forced to make a bet with the Goblin King (Bowie) in order to get her brother back. She must make it to the center of the Goblin’s elaborate Labyrinth, in order win and retrieve her brother. As a way of making it through the deadly maze, Sarah makes friends along the way, each with their own unique abilities to help her, which are all needed by the end. When one thinks of puppetry magic, Jim Henson is usually the first name to come up. Henson often collaborated with George Lucas, Frank Oz and an assortment of other incredibly talented artists who were able to realize their vision with his help, but he had a few projects of his own. Henson’s fantasy films all seem to have a great deal in common, in that they all involve a journey into the unknown, always made by a unique creature. In many cases the unique creature is simply a human girl, but in the world of Jim Henson, it is unique to be ordinary. They all have an Alice in Wonderland and Wizard of Oz feel to them, but with the inclusion of plenty of puppets. 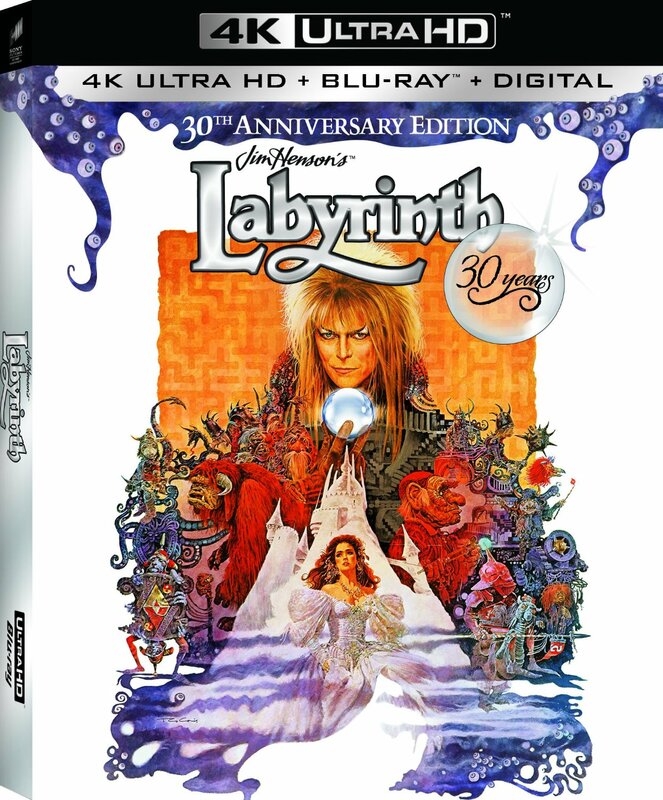 The 30th Anniversary 4K Ultra HD release of Labyrinth offers the most pristine video and audio for this beloved fantasy film, bringing into focus details that I had never noticed. The special features from the previously released Blu-ray are transferred over, including a commentary track with Brian Froud, a making-of documentary and exploration through the sets of the film. 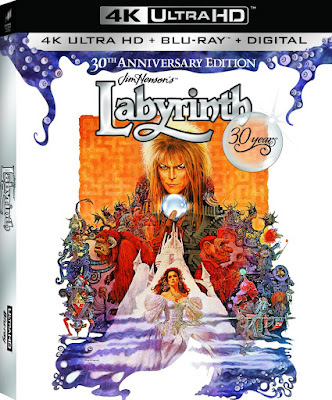 The Anniversary Edition also has exclusive new features, including retrospective featurette “Reordering Time: Looking Back at Labyrinth.” There is also a featurette about the legacy of work created by Jim Henson, a retrospective for David Bowie, and an anniversary Q&A. The 4K release also comes with a Blu-ray disc and Digital HD copy. In addition, there is a separate Blu-ray release which comes in a Blu-ray sized collectible book.